Folks at The Bushnell hope that the momentum caused by “Hamilton” this season will continue with the 2019-20 season with three Tony Award-winning musicals playing The Hartford hall: “Dear Evan Hanson,” “The Band’s Visit” and the revival of “Hello, Dolly!” currently touring the country with Betty Buckley. Additionally, it was announced that” Hamilton” would return to Hartford during the 2020-2021 season. No dates were given when The Bushnell announced its new season tonight. The show played a record-breaking , sold-out three-week run at The Bushnell last December, boosting subscriptions 50 percent to 9,500 and grossing more than $13 million . Also featured in the new season are “Dr. Seuss’ HOW THE GRINCH STOLE CHRISTMAS” (Dec, 13 to 15) and BLUE MAN GROUP (May 8 to 10, 2020). A legendary roster of Grammy Award winners. A visionary director and a Tony-winning design team. One of the world’s most beloved characters. Turn them loose on stage and what do you get? The musical The New York Times declares, “BRILLIANT!” Broadway’s best creative minds reimagine and bring to life the beloved Nickelodeon series with humor, heart and pure theatricality in “a party for the eyes and ears” (Daily Beast). Explore the depths of theatrical innovation in THE SPONGEBOB MUSICAL, 2018 Best Musical winner of the Drama Desk and Outer Critics Circle Awards, where the power of optimism really can save the world. Inspired by the beloved films, the romantic and adventure-filled new musical ANASTASIA returns to Connecticut, where it premiered at Hartford Stage in 2016! From the Tony-winning creators of the Broadway classic Ragtime, this dazzling show transports us from the twilight of the Russian Empire to the euphoria of Paris in the 1920s, as a brave young woman sets out to discover the mystery of her past. Pursued by a ruthless Soviet officer determined to silence her, Anya enlists the aid of a dashing conman and a lovable ex-aristocrat. Together, they embark on an epic adventure to help her find home, love, and family. ANASTASIA features a book by celebrated playwright Terrence McNally, a lush new score by Stephen Flaherty and Lynn Ahrens with direction by Tony winner Darko Tresnjak. JESUS CHRIST SUPERSTAR is an iconic musical phenomenon with a world-wide fan base. In celebration of its 50th Anniversary, a new mesmerizing production comes to North America. Originally staged by London’s Regent’s Park Open Air Theatre and helmed by the acclaimed director Timothy Sheader and award winning choreographer Drew McOnie, this production won the 2017 Olivier Award for Best Musical Revival, garnering unprecedented reviews and accolades. Appealing to both theater audiences and concert music fans, this production pays tribute to the historic 1971 Billboard Album of the Year while creating a modern, theatrical world that is uniquely fresh and inspiring. 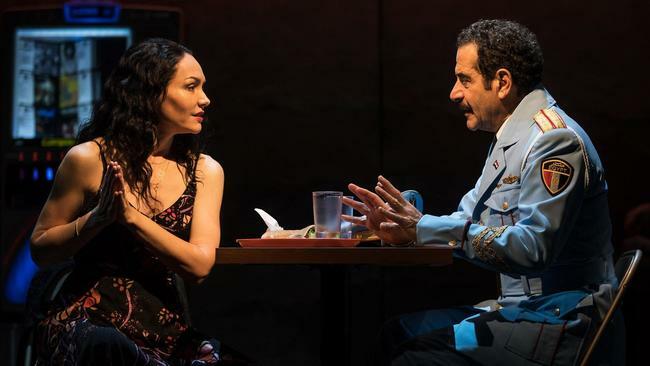 THE BAND’S VISIT is the winner of ten Tony Awards, including Best Musical, making it one of the most Tony-winning musicals in history. In this joyously offbeat story, set in a town that’s way off the beaten path, a band of musicians arrive lost, out of the blue. Under the spell of the desert sky, and with beautiful music perfuming the air, the band brings the town to life in unexpected and tantalizing ways. Even the briefest visit can stay with you forever. With a Tony- and Grammy-winning score that seduces your soul and sweeps you off your feet, and featuring thrillingly talented onstage musicians, The Band’s Visit rejoices in the way music makes us laugh, makes us cry, and ultimately, brings us together. Welcome to Margaritaville, where people come to get away from it all—and stay to find something they never expected. With a book by Emmy Award winner Greg Garcia and Emmy nominee Mike O’Malley, ESCAPE TO MARGARITAVILLE is the musical comedy featuring both original songs and your most-loved Jimmy Buffett classics, including “Fins,” “Volcano,” “Cheeseburger in Paradise” and many more. USA Today calls it "A little slice of paradise!" and Entertainment Weekly raves, "It will knock your flip-flops off!"